I’m a big fan of the new Nexcare™ Sensitive Skin product line, as you can see here. I mean, what’s not to like? A high-quality product that serves a very valuable purpose and actually takes into account your comfort and happiness? Plus, it makes life easier for me AND my family? I’m in. I suppose many of you may be asking… how important, really, could the right first aid products be? I know, in the mix of your hectic lives and busy schedules, where taking a 5-minute pause sometimes seems impossible, this probably doesn’t seem all that important. However, maybe it’s good for you to consider some really important statistics that are relevant to you and your family. Nexcare™ Brand recently conducted a survey** and I wanted to share the key results with you. I think it should shed some light on how many of us have to deal with sensitive skin issues and how the products in the Nexcare™ Sensitive Skin collection can really make a difference… for you and your family. Listen to this. Can you believe that 71% of Americans have been bothered by skin sensitivity at some point, and nearly 2 out of 5 Americans (39%) are frequently bothered by it? It’s true, and pretty crazy. On top of that, over 1 in 10 Americans (12%) are bothered by skin sensitivity all the time! Millennials are more likely to be bothered by skin sensitivity than Boomers with half of Millennials (50%) bothered compared to almost one third (32%) of Boomers. Enough about me. Let’s be honest. When we have families, we are going to worry about them even more than we worry about ourselves. In fact, an average of 66% of parents are concerned with the sensitivity of their child’s skin, with that number increasing to 76% among Millennial parents. Dealing with these owies is also a major issue that I think directly relates to these skin worries! 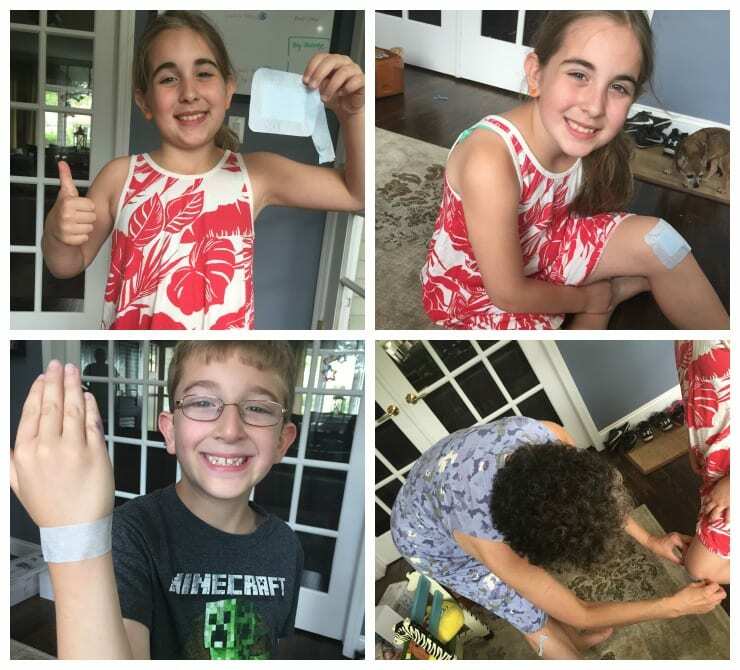 Did you know that over 9 in 10 parents (91%) have tricks that they use for helping ease the process of pulling off bandages or first aid dressings? It’s crazy. These tricks include: pulling it off quickly (57%), letting their children pull it off themselves (36%) and distracting them with a funny face (29%). These are some insanely high numbers, don’t you think? My kids are no exception to any of this. They hate having to tend to a wound. They also have, well, kid skin. It’s still soft and very sensitive. Now with the summer months raging, there are more cuts and scrapes than I would like to really talk about. I may have nightmares. Liam, Natalie, and even little Caleb are running around like crazy people all day long. The baby is, well, a baby… so he loves falling down when trying to keep up with his beloved big brother and sister (and all their friends). Natalie plays tag, hide and seek, monkey bars, and all types of gymnastics… tumbles and scrapes are a given. Liam, well, he’s an 8 year old boy in all types of camps, playing some soccer, basketball, and who knows what else those 8 year old boys go around doing!! LOL, he’s a mess just about every day. We need to have first aid supplies that don’t cause the break out of WWIII!! 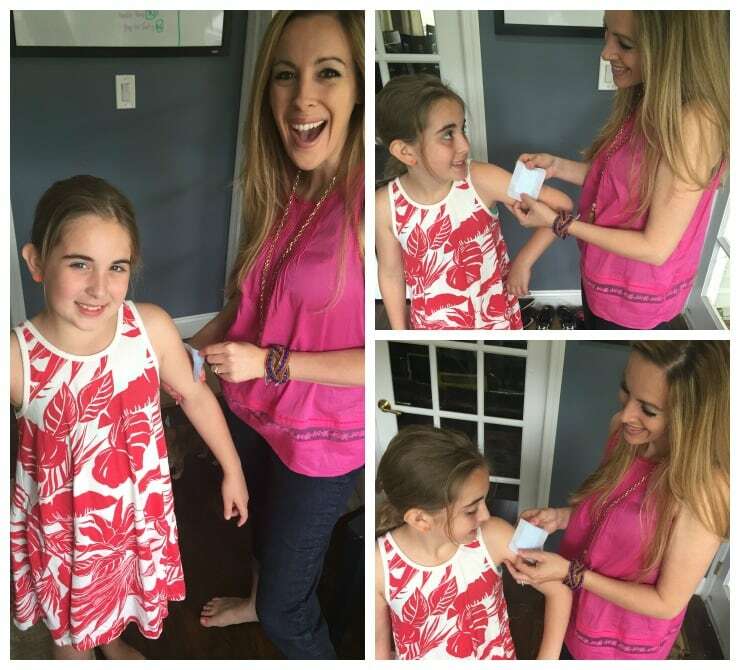 Nexcare™ Sensitive Skin dressings and tape, are really a home run with my kids (so they make mommy and daddy pretty happy as a result)! Do you know how much easier, calmer, and just plain nicer it is to use these products when dealing with them and their minor injuries? It’s like night and day, black and white, Simon and Garfunkel (ok, that one didn’t make sense)! I can’t even describe it, really. They don’t squirm, squeal, or even care that I am putting them on. There is no need for those slight of hand, magic tricks needed anymore. It’s all because they know that taking these off won’t “kill” them in all the ways they are used to. It’s like a weight has been lifted off of their shoulders, and mine. It’s fantastic… life is so much better for us all these days. Summer rules! My kids are not alone in fearing “the bandage” either! Old school, painful bandages and first-aid tape cause many of us undue stress and discomfort. I mean, 40% of Americans dread pulling off a bandage more than getting a shot, with 43% of Boomers typically dread pulling off a bandage or first aid dressing more than getting a shot, and 34% of Millennials dreading the same. It seems like this is a pretty big issue for people! Even my husband Bill has some sensitive skin issues. He is very fair, but he also has some dry skin issues, too. While he’s not scared of bandages at all, he still experiences very irritated skin from traditional bandages. The blotchy, itchy, redness left behind is a real pain, literally. The Nexcare™ Sensitive Skin collection really came in handy for him recently, too. No kidding. 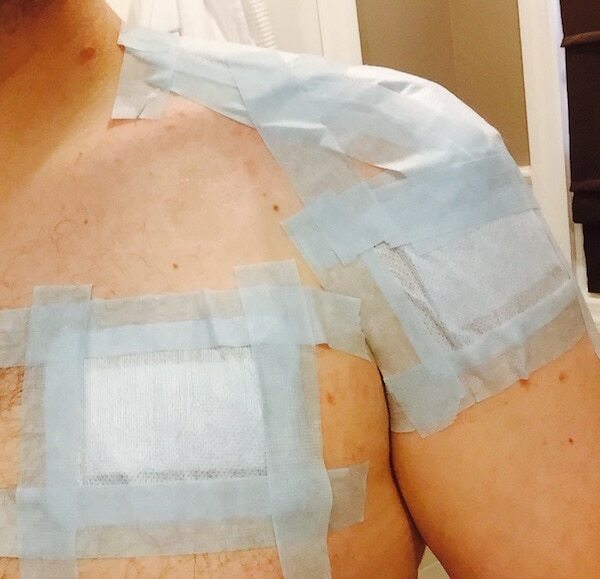 He got a few cuts and scrapes on his chest, shoulder, and stomach…nothing major…he just needed to cover everything up to make sure it healed with no infection. Because of the location of the injuries, he also had to really tape around all the bandages to make sure they stayed in place all day and through the night. Thank goodness we had the Nexcare™ Sensitive Skin products! He wrapped, unwrapped and taped until his heart was content (he’s a bit OCD with some things) and didn’t have an issue. It was awesome to see, and it really did the trick. He kept saying that these bad boys are a must in the medicine cabinet for us from now on. For him to get so excited and be so committed to a first-aid product, it must be special!! For all of you that do not want to live with all of your “bandage issues,” free yourselves!! We now have such an amazing solution!! Nexcare™ Brand from 3M offers a new line of first aid products specially formulated for sensitive or fragile skin with the Nexcare™ Sensitive Skin collection. This is ideal for those with fragile or sensitive skin, infants, kids, and the elderly. Nexcare™ Sensitive Skin First Aid Tape, Nexcare™ Sensitive Skin Adhesive Pads, and Nexcare™Sensitive Skin Eye Patches provide long-term adhesion, yet remove cleanly and easily with minimal hair pulling and kind removal. The line of products are breathable, are repositionable for optimal placement, and feature adhesives that are hypoallergenic and water-resistant!! The Nexcare™ Sensitive Skin line is priced from $7.49 and is available in the pharmacy section of major retailers nationwide. For example, Nexcare™ Sensitive Skin First Aid Tape is available at Walmart, Target, CVS, Walgreens, Rite Aid, and select grocery stores. Nexcare™ Sensitive Skin Adhesive Pads is available at Walgreens and select grocery stores. 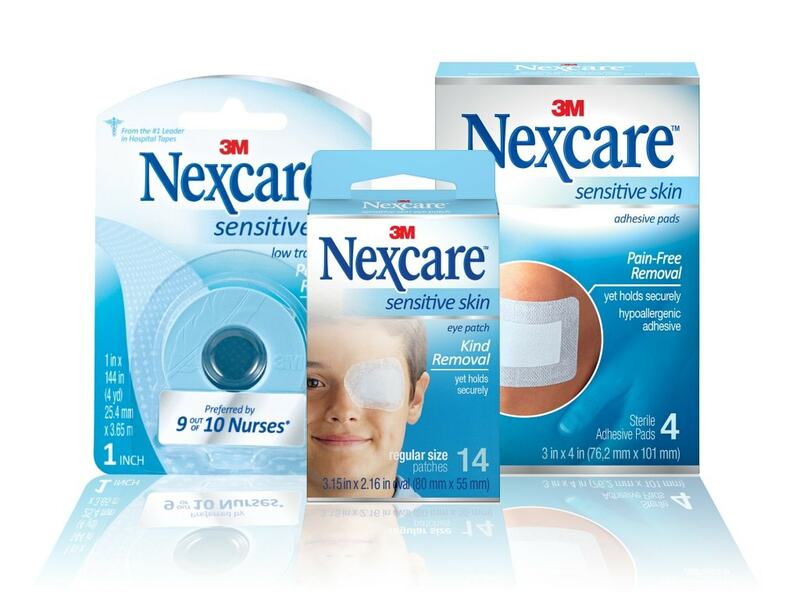 Nexcare™ Sensitive Skin Eye Patch is available at Rite Aid and select grocery stores. *Lady and the Blog LLC received compensation for this post. All opinions of wonder that were expressed are my own. **The Nexcare Survey was conducted by Wakefield Research (www.wakefieldresearch.com) among 1,000 nationally representative U.S. adults age 18+, between May 1 and May 7, 2015, using an email invitation and an online survey.